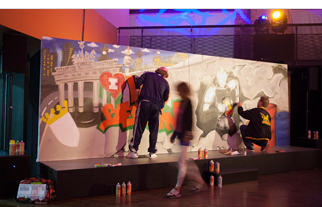 Urban Artists is offering graffiti workshops, streetart, art and tapeart for groups and teams from 5 up to more than 500+ participants in berlin, germany and worldwide. 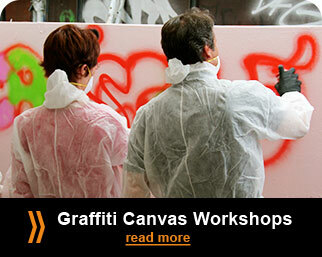 The Portfolio for Teambuilding and Workshops with Graffiti, Streetart & Art Workshops. 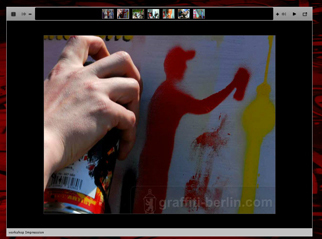 We offer Graffiti-Eventsfor big groups in Berlin, Germany and worldwide. Mit mehr als 300 Teilnehmern gestaltete das Team der Urban Artists 8 unserer einzigartigen Graffiti-Taschenmauern gemeinsam mit den Teilnehmern in diesem extravaganten Graffiti-Workshop bzw. Teambuilding Incentive Event. Im Vordergrund stand ein Contest in dem die 8 Teams gegeneinander antraten und es gab Gewinner in 3 Disziplinen. Es war einzigartig, gigantisch und eindrucksvoll - sehen Sie selbst! From now on we are offering NEON! and blacklight graffiti for your events and teambuildings. The perfect solution for exhibition stands and show-graffiti. We presented the graffiti wall of bags At Citroën & Style Up Your Life design contest at vienna and produced a limited collection of graffiti bags for this event. Urban Artists painted show graffiti and graffiti workshop on the rooftops of london to represent the modern style of berlin. From now on, we offer you at this point an extravagant, colorful and modern range of graffiti workshops, show-graffiti-stunts , graffiti-bags workshops, stencil and canvas courses in incredible atmosphere. Ideal for your events, concerts and exhibitions! In cooperation with the YAAM in Berlin, we also offer a unique location for our workshops with pure holiday atmosphere. Our workshops do not only provide you with smashing fun, they also give you the opportunity to practice successful teambuilding with unforgettable moments. We are looking forward to your inquiry! 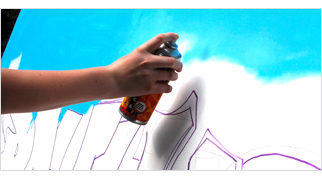 From now on, Urban Artists offers creative workshops on graffiti, street art, stencil art, and many other techniques. Our workshops in Berlin and the surrounding area offers insight into real, genuine and artistically committed Berlin. 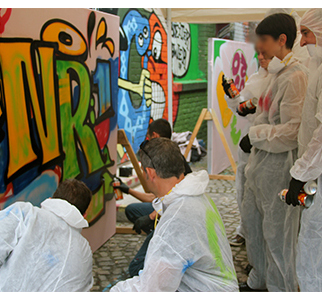 The workshops of urban artists are ideal for groups, teams and team building. Enjoy, as well as your customers, the unforgettable moments and locations and experience our artists in action with paint, spray can and pens. All workshop participants are professionally involved by our workshop leaders (Supervisor) and clamped and supported from brainstorming for the design to the final product / outcome. At the end of every workshop, individual and impressionist masterpieces by the workshop participants are being created - often with company logo, event slogan or individually tailored themes and subjects. We are looking forward to your workshop request. You are looking for the creative highlight for your exhibit or event? 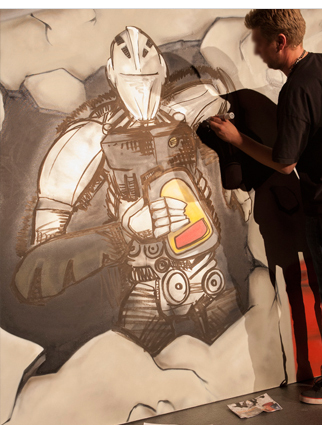 Urban Artists offers individual possibilities and the right performance for your event. Let’s vote together for the appropriate insert for your event. Tangy, fresh, modern and creative graffiti and street-art style. We offer creative ideas and authentic artists for your event. In addition to the workshops, event and show performances, we offer our customers additional, sustainable features, such as a professional photo documentation of the event. If required, we also create small websites (microsites with branding) and digital photo galleries so that everyone can access the beautiful mood-pictures and the workshop online and worldwide. The footage is then already in print quality and can be used for internal and marketing purposes. These features make every event modern, digital and unforgettable! 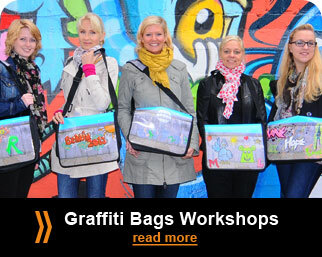 Urban Artists documents all graffiti workshops, team building, event Graffiti and all other projects, such as the graffiti-bag-wall and Graffiti-bag-workshops to capture the great atmosphere at our workshops. Just click to go to the next picture to see the graffiti workshop overview. These beautiful images of our events and Incentives are a must-See. If it’s already itching you to join just by looking at the workshop photos or if you have questions about the running of our graffiti workshops- please contact us. We are looking forward to your inquiry and would like to develop an individual concept for your event / incentive / event or exhibition with you. 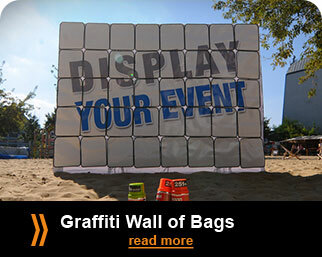 Since we are creating little but do experiment day and night to create innovations for your event, exhibition, teambuilding, incentive and of course our graffiti workshop, we are now proud to offer another unique graffiti-module. From now on we also offer NEON or Black Light Graffiti workshops and NEON Graffiti for Events! Let it shine! More information about Urban Artists NEON Blacklight Graffiti Workshops and Graffiti NEON-show follow shortly.